1.2 What is Bluetooth Wireless Technology? 1.3 Overview of the Bluetooth Stack architecture 1.4 What is J2ME? Adoption of Bluetooth wireless technology has made great strides in the last few years. 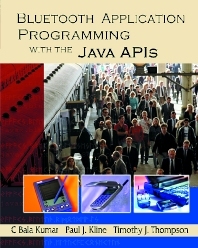 One of the biggest steps forward—the standardization of Java APIs for Bluetooth wireless technology (JABWT)—is explained in detail in this book. The JABWT standard, defined by the JSR-82 specification, supports rapid development of Bluetooth applications that are portable, secure, and highly-usable. Wireless device manufacturers have responded to the JABWT specification by announcing mobile phones and other products that will run JABWT applications. Bluetooth Application Programming with the Java APIs explains in detail how to write Bluetooth applications using the Java APIs to exploit the power of both technologies. Written by the specification lead for JSR-82 and two other key participants in the definition of JABWT, this book provides the authoritative explanations and concrete examples you need to get started right away. C Bala Kumar is a Distinguished Member of the Technical Staff at Motorola. He chaired the industry expert group that defined the Java APIs for Bluetooth wireless technology. He currently leads the systems software team for wireless platforms in Motorola's Semiconductor Products Sector. Paul J. Kline is a Distinguished Member of the Technical Staff at Motorola and the maintenance lead for the JABWT specification. He currently works on the System Software Architecture team in Motorola's Semiconductor Products Sector. Timothy J. Thompson is a Senior Software Engineer on the System Software Architecture team in Motorola's Semiconductor Products Sector. He was the OBEX architect on the JABWT specification team at Motorola.